Dysautonomia (Autonomic Dysfunction) is a disorder of autonomic nervous system. Dysautonomia affects Autonomic Nervous System (ANS) of local sites or can cause generalized autonomic failure. It can be acute and reversible or chronic and progressive. Dysautonomia is a primary condition in Parkinson's disease and degenerative neurological diseases. There are several underlying causes for the disease, such as Amyloidosis, Antiphospholipid syndrome, Celiac disease, Chiari malfunction, Diabetes, Alcoholism, Hereditary sensory and Autonomic neuropathies to name a few that cause Dysautonomia. Dysautonomia symptoms are many and are usually invisible, but in particular Orthostatic intolerance, Urinary dysfunction, decreased sweating, Dizziness, Tachycardia, Bradycardia are few among them. There is no cure for Dysautonomia, only underlying ailments are treated in secondary form of the disease whereas primary Dysautonomia is symptomatic and supportive. Factors driving global demand for Dysautonomia are increasing awareness amongst people, government initiatives and increased diagnosis. There has been more focus towards research and development to bring novel drugs to treat Dysautonomia. Also, approval of new and highly effective drugs for the treatment of the disease will increase the market size. However, drug related side effects and low efficacy of available drugs will restrain growth of the market. In addition, high generic competition and off label use of drugs will lead to price erosion and ultimately impact the overall growth of the market. This report provides information on Dysautonomia market size for the year 2014-2016, and forecast of the same for year 2021. 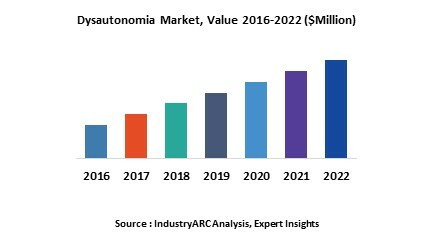 It also focuses on market drivers, challenges, restraints, market dynamics, growth indicators, competitive landscape, potential growth opportunities and other key aspects with respect to Dysautonomia. Geographically the Dysautonomia market is segmented into North America, Europe, Asia Pacific and other countries. North America has high incidence of the disease with best infrastructure available and growing awareness makes North America a potential market for Dysautonomia. Additionally, government initiatives and Non-Governmental Organizations (NGO) programs to bring awareness about the diseases and introduction of new molecules will further grow this market. Europe is considered as the second largest market for Dysautonomia. Dysautonomia Foundation and National Dysautonomia Research Foundation have made significant contribution towards spreading awareness of this disease. In addition, Asia-Pacific market is driven by launch of improved drugs.